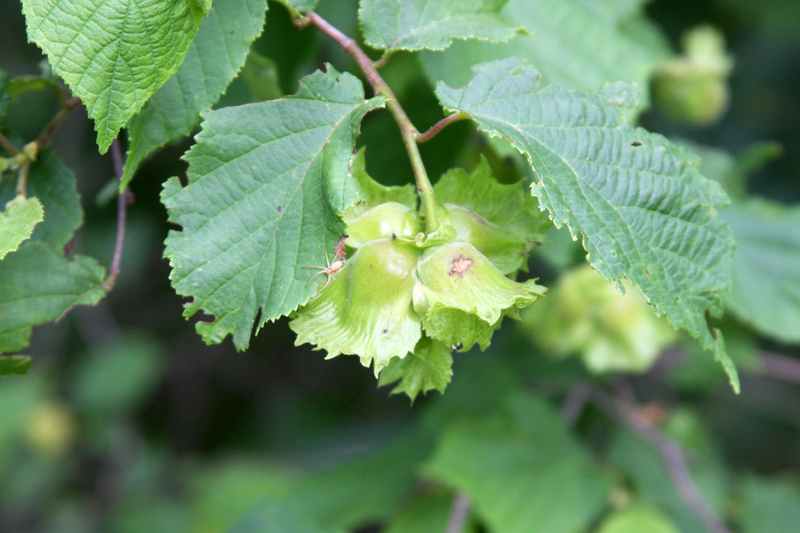 Corylus americana fruit. commons.wikimedia.org (Accessed 5/2014). 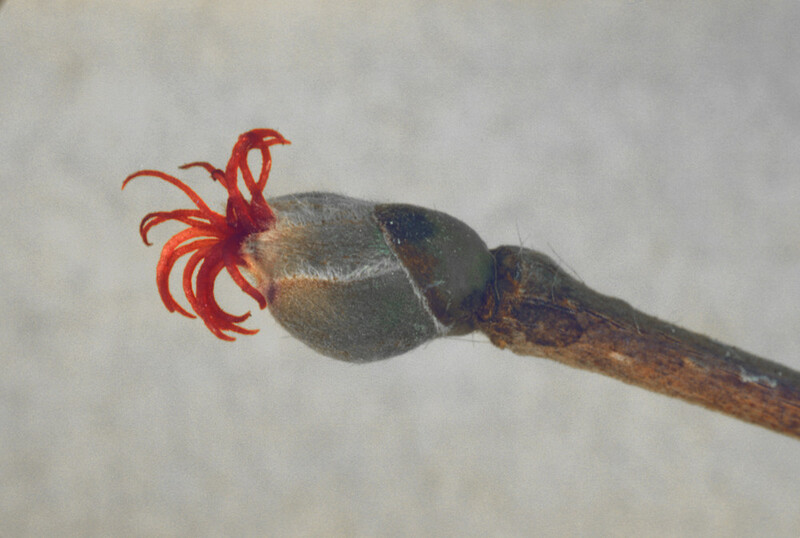 Corylus americana is a shrub to 3 m tall, twigs hairy, young hairs red. 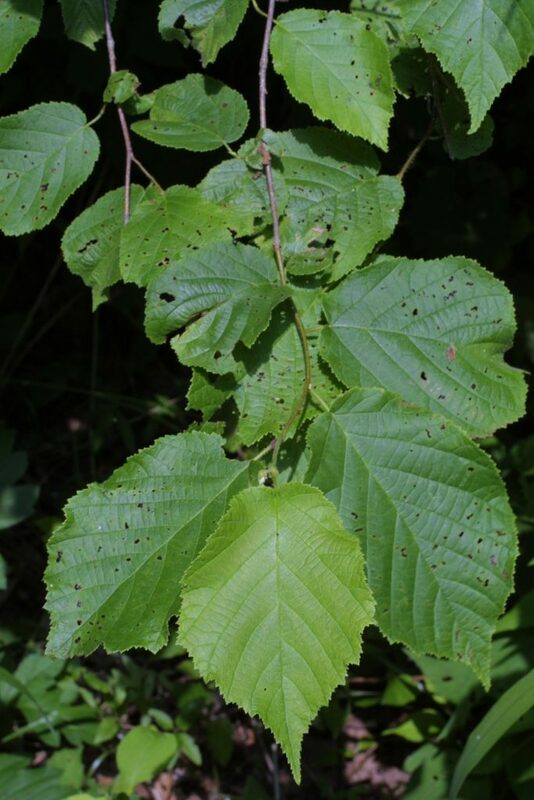 Corylus americana leaf. Creative Commons Attribution-ShareAlike 3.0 License. woodyplants.wdfiles.com (Accessed 1/2018). Leaves alternate, broadly egg-shaped or widest above middle, finely doubly toothed, base rounded to lobed, stalk smooth, expanded mid-May (Britton 1874). Corylus americana male catkins. By Frank Bramley. Copyright © 2018 New England Wild Flower Society. gobotany.newenglandwild.org (Accessed 1/2018). Flowers sexes separate on same plant (monoecious). 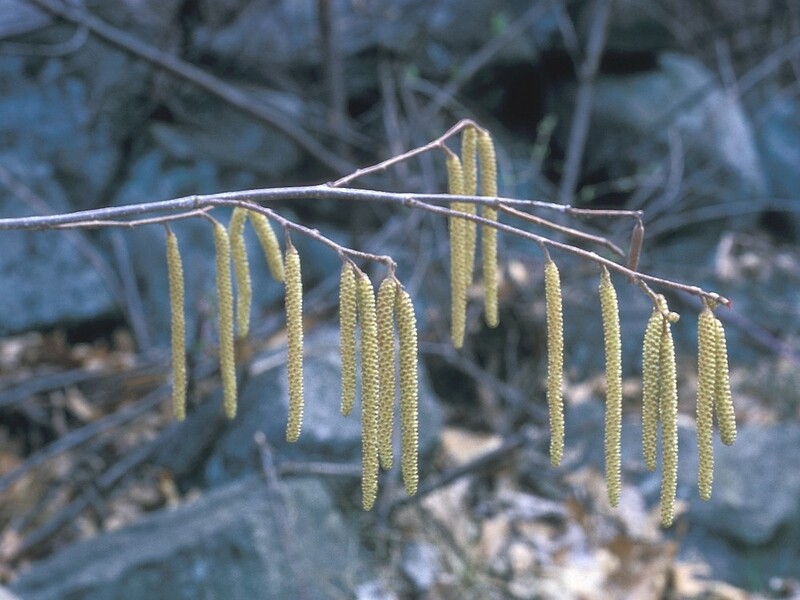 Male flowers minute, dull yellow, in long catkins, on short stalks, female flowers red, very small, March (Britton 1874). Corylus americana female flower. By Frank Bramley. Copyright © 2018 New England Wild Flower Society. gobotany.newenglandwild.org (Accessed 1/2018). Fruit a nut enclosed in bracts to 3 cm long, with toothed margins. Nuts and catkins eaten by mammals and larger birds, twigs eaten by rabbits and deer (Martin, et al., 1951). Habitat: Moist, undisturbed forest understory, edges and successional scrub. Soil pH 6-7.5. Tolerant of shade. Moderately tolerant of drought, soil compaction. Intolerant of salt, flooding (Hightshoe 1988). Notes: Twigs eaten by rabbits and deer (Martin, et al., 1951).